Yeah, yesterday was Presidents' Day, which by-the-way is still officially known by the U.S. Government as Washington's Birthday, and I celebrated like I always do: writing another chapter in the book of haiku about Benjamin Harrison that is my life's work. As patriotic and appropriate as that was as a way to spend the holiday, I have to say that my beautiful bride Donna totally out-Presidented me yesterday. She and her Pop were in Simi Valley, California visiting the Ronald Reagan Presidential Library. They even got their photo taken on board Air Force One! 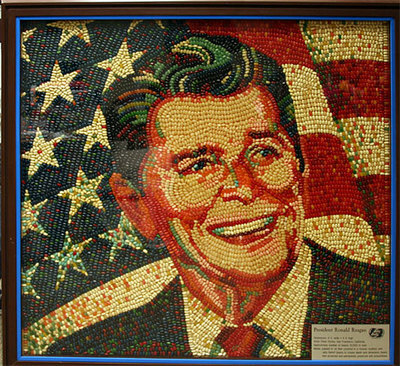 She reports back that it was a wonderful way to spend the afternoon and if there was any bad news it's that they recently took down the portrait mosaic made of jelly beans that hung in the library. 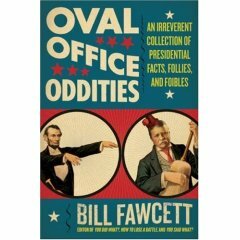 That news, unfortunately, makes the just released yesterday new book Oval Office Oddities already outdated. Author Bill Fawcett suggest these other fascinating places to visit too and I'm pretty sure they are still there. In Washington D.C., the USS Sequoia, the 104 foot former Presidential yacht, now open for tours, where you can see the scratch in the table where Harry Truman damaged it with a cigar cutter after a particularly bad hand of cards. In Palm Springs, California, the Seven Lakes Country Club, where former president Eisenhower shot his very first hole-in-one after decades of playing golf. Back to D.C., the Willard Hotel, where the term "lobbyist" was born! President Grant hung out in the lobby there almost every night for a drink and a cigar and people would wait there for him to get there so they could get his ear. Springfield, Illinois, Abe Lincoln's tomb. Go to hear the story of the two guys who tried to steal the body in 1876. They would have gotten away with it too if it weren't for some meddling kids. P.S. There was no law against stealing a body in Illinois so they were only charged with breaking the lock on the tomb. P.S. I should have remembered this in time for yesterday's post but here it is now. "Same goes to you crazies who spell "wacko" as "whacko." What the hell are you thinking?" Why you gotta come at "Whack-a-Mole" like that? I work at the library, how long was Donna's wait to get in? Probably like 30 minutes, right? Anyway, stuff tends to disappear around there and just randomly show up in another place with no mention to anyone. Hope Donna had fun, maybe I'll see you there soon. I think wacko and whacko might mean different things. wacko, similar to wacky implies craziness while whacko, similar to whack, implys hitting something/someone that hits things? I have been to the Reagan Library, and I have to say I thought it was great. That man have some belt buckles, let me tell you. Air Force One is pretty cool, but what I found even cooler, you can buy beer in the gift shop right underneath AFO...Awesome. I'm prepared to renounce any claim I might have on your estate with regard to the book of haiku about Benjamin Harrison. I feel very stongly that it should belong to the world and not any one individual.